This article is a cross-posting from sister site Macworld Australia. 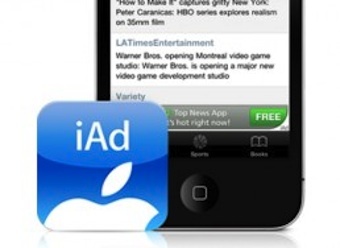 The Advertising Age (AdAge) has reported that Apple is planning to introduce full-screen video iAds for its iOS devices later this year. The ads, also known as interstitials, are a significant development for Apple, which has to date utilised mobile banners that need to be clicked on for a brand’s video iAd to play. The new ads will possibly interrupt whatever the user is doing, though AdAge suggests it is likely that they will play “at moments of transition, like after completing a game’s level or finishing an article”. MacRumors notes that the concept is not entirely unheard of. “Some free-to-play apps already feature full-screen third-party video ads. Zynga’s Draw Something on iPad, for example, requires users to watch a video ad before allowing them to move on to the next level, a task that takes several seconds away from gameplay. Apple currently permits full-screen video iAd advertisements within some iPad apps, but today’s report suggests the ads could also be extended to other iOS devices,” says the site. It has yet to be revealed how the ads will be priced, though AdAge quotes ‘one person’ who believes that the Cupertino, California company “may sell the units through its ad exchange that quietly rolled out ‘a couple of weeks’ ago”. We reported last month that iAds have not been the money maker for Apple that the company may have initially envisaged when it launched the feature in 2010, with its US$258 million in revenue last year dwarfed by the streams raked in by rivals Google (US$3.98 billion) and Facebook (US$1.53 billion). Advertisers signing up for iAds were originally looking at US$1 million to book a rich-media unit (more of a mobile microsite than a banner), but that price has since dropped right down to US$100,000. While the response to the suggestion of automatic full-screen ads on iDevices drew howls of horror from commenters on the MacRumors forums including a memorable gif from MacRumors member SethBoy (pictured right), AdAge reports that advertisers will probably welcome the move. The outlet interviewed Magna Global’s managing director of programmatic, Neeraj Kochar, who said the concept was “compelling”, before warning that the (as yet to be announced) price structure could be offputting. “Advertisers will test into it, potentially as part of bigger deals with Apple,” Kochar told AdAge. MacRumors also notes that Apple has been making waves in the iAds area of late, trying to revive the initiative, by focusing on its application in iTunes Radio, which has already lined up deals with a bevy of giant advertisers, including McDonald’s, Pepsi, Nissan and Proctor & Gamble.